While most of my American friends were home with their families on November 22nd to celebrate the Thanksgiving holiday, I was working at Samsung, as this isn't a holiday in Korea! I did miss not being home that day but certainly the US was too far to travel from Seoul for a 4-day weekend, especially as I'm already taking time off to go back for Christmas. 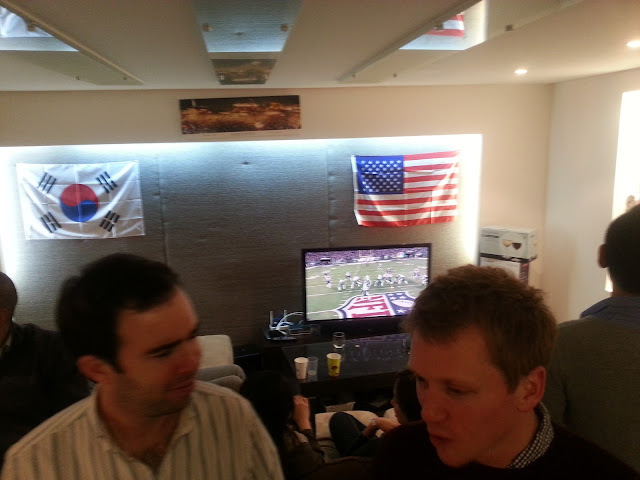 However, I work with many Americans in my group who also felt home gripping at their emotions, so a group got together to celebrate the holiday at my colleague's apartment in the Hannam-dong neighborhood. We invited our non-American friends as well to make this the most international Thanksgiving ever. My colleagues were able to find a store that would cater a cooked turkey for us, along with mashed potatoes, stuffing, gravy, cranberry sauce, pumpkin pie, and more. We even had the taped Thanksgiving day football games playing in the background to create a true American ambiance. Though we celebrated on a Saturday and not a Thursday, I still heartily stretched the limits of my stomach. The feast was delightful and almost felt like home. I even went back for leftovers this afternoon, in true Thanksgiving tradition. Having friends to celebrate this adventure we're having in Korea...something to be quite thankful for this year! Dear South Korea, sorry that we held your flag upside-down! !